Beekeeping started with hollowed logs and straw skeps. 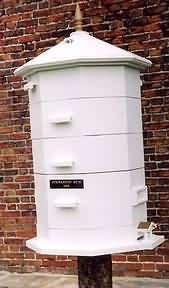 When wooden hives became popular, there were many and varied designs promoted by manufacturers and sold locally or nationally. There are still plenty of people who think the world needs a better bee hive and they have just the thing.